You are here: Home / Family Law / Who Gets the Ring? Since an engagement ring is considered a conditional gift, when an engagement is broken, the engagement ring should be returned to the giver. A broken engagement can be a confusing and emotionally painful experience. Aside from the usual sadness, the once engaged individuals must now decide who will keep the engagement ring. Courts across the country vary on this issue, but the answer usually depends on how that specific court classifies what the engagement ring is – is the ring a gift or a condition of marriage? The court’s view on this issue often determines the outcome of which party gets to keep the engagement ring. The giver’s intent is that the ring is a gift. The giver physically gives the ring to the receiver. The receiver accepts the ring as a gift. In most cases that involve a gift being revoked where all three elements are present, the court holds that the given item, in this case the ring, is a gift, and the receiver can retain that gift. “Conditional gifts” are an exception to the “gift giving” rules outlined above. 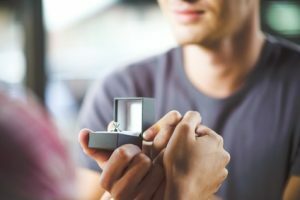 While the receiver of the ring can prove the ring was a gift, the court could find that it was a “conditional gift,” which is a gift that is given to the receiver with the expectation that an action will take place. Should the agreed upon action not take place and the condition of the gift is not met, the giver of the gift has the right to receive the gift back. Most courts classify an engagement ring as a conditional gift. Since an engagement ring is considered a conditional gift, when an engagement is broken, the engagement ring should be returned to the giver. However, in some cases, the receiver of the ring argues that answering the giver’s proposal for marriage and entering into the engagement with him or her met the condition of the gift, and that it does not need to be returned. This argument, which may make sense on a certain level, is usually not accepted by the court, and the ring is often ordered to be returned. At this time, most states follow the “conditional gift” methodology when it comes to engagement rings. There are some states, such as the state of Montana, that still view an engagement ring as an unconditional gift, in which case the ring remains with the individual who received it.